A University of Saskatchewan product, Scott Flory established himself as one of the best offensive linemen in CFL history after being a third round pick by Montreal in the 1998 CFL College draft. After joining the Montreal in 1999, , Flory has played 13 plus seasons, all with the l Alouettes. In those years, Flory has won 11 East Division All-Stars and 9 CFL All-Stars. In his third season, Flory started a streak of 11 years from 2001 to 2012 as an East All-Star. In that same time, Flory only missed CFL All-Star in 2004 and 2011. Unfortunately, Flory's streak ended in 2013 when he suffered a season ending injury in July. (see note below). Flory has twice been named the Outstanding Offensive Lineman in the CFL in 2008 and 2009 and in anothe four seasons was the East's Outstanding Offensive Lineman and hence runner-up for the CFL award - 2003, 2005, 2006 and 2010. Flory was born in Regina aqnd attended the University of Saskatchewan. Also, Flory was for a very short time a member of the Saskatchewan Roughriders. In 2004, in a short lived bout of insanity, the Alouettes let Flory escape to the Roughriders as a free agent. The Riders wanted to move Flory to the other side of th o-line to pair him up with Andrew Greene at the guard spots, but Flory balked at the move, and the Riders ended up trading him back to Montreal for a first round draft pick. The Montreal Alouettes announced on Monday that Scott Flory's MRI results from earlier in the day show a complete bicep tear, meaning that the veteran guard will be out for the remainder of the season. As expected, the results of the MRI are not what we wanted to hear, but are what our medical team suspected," explained Alouettes General Manager Jim Popp. "Injuries are a part of sports and unfortunately, Scott sustained a fluke one. 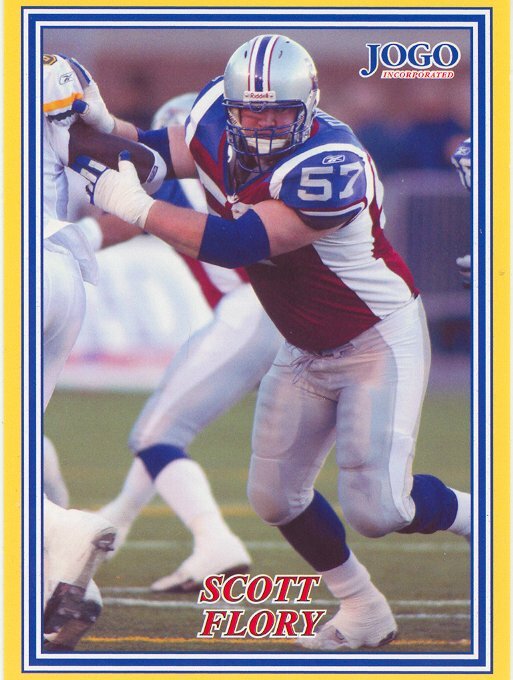 Scott has been an institution at right guard for our team and the CFL. He will be missed on the playing field, but not forgotten. Its possible that Scott will undergo surgery as soon as Thursday, and we wish him and his family a speedy recovery and hope that he will return to the locker room and sidelines once he feels better, and continues his leadership." Flory also has a total of 12 tgackles.